So proud to announce that Triple Threat Casting is casting the return of TLC’s hit TV show NATE & JEREMIAH BY DESIGN Season 3! Please feel free to share and repost! TIA! Are you stuck in a renovation nightmare? Do you and your other half differ in design tastes and often disagree? Are you constantly making bad decisions and costing you lots of money? Let Nate Berkus & Jeremiah Brent rescue your renovation! If you’re dreaming of having two of the most sought-after design experts rescue you from your home, now is your chance. 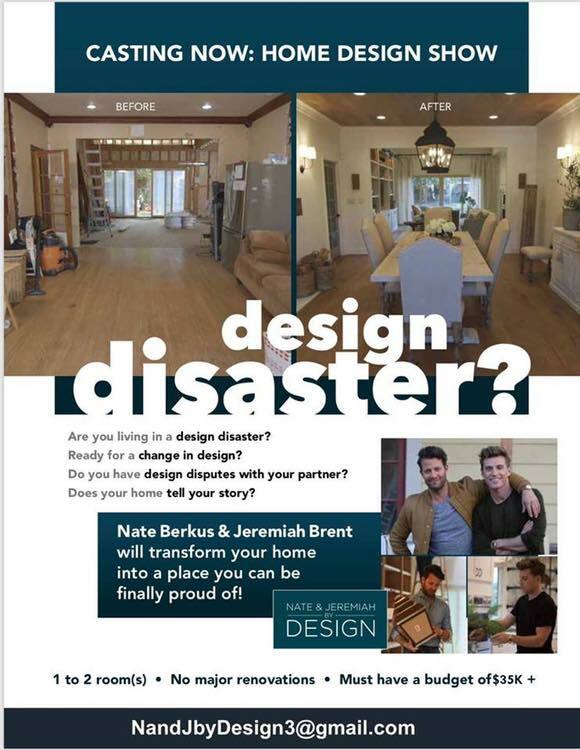 Accepting submissions from homeowners in the Greater Los Angeles area who want Nate Berkus & Jeremiah Brent to turn their design disaster into a stunning masterpiece. *You must have a budget of $35K+ and be available for up to 5 nonconsecutive days of filming to be considered for this show. Hello, I am praying you are my answer from above. My sons family is living in a mess. They bought a home 3 years ago and started to renovate their home. This last year they had a baby and the home is a mess and not safe to raise the baby in. There is no Kitchen to make meals and the bathroom is a mess to give the baby a bath. Please I ask help for my son as he has so much pressure on him to be a father and have a home for his family to be happy in. He is such a hard working and loving person. He is trying to give his family a home but I am afraid he can’t do it alone. Please be the answers to my prays. I love the show and your family. I only want my son to have a family home that is safe and comfortable. We live on beautiful lake Minnetonka in Minnesota. The upstairs is our single level living (although I would like to update/change some of it), but the lower level is wasted space, and could become an amazing bar/wine cellar….. Would love your guidance. Your style is fabulous! Please help!